Solar cooling systems can be a cost-effective and environmentally attractive air-conditioning solution. The design of such systems, however, is complex. 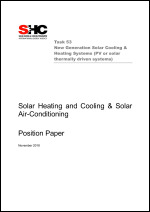 Research carried out under the aegis of the International Energy Agency's Solar Heating and Cooling Program has shown that there is a range of seemingly subtle design decisions that can impact significantly on the performance of solar cooling systems. In order to reduce the risk of errors in the design process, this guide provides detailed and very specific engineering design information. It focuses on case study examples of installed plants that have been monitored and evaluated over the last decade. For three successful plants the design process is described in detail and the rationale for each key design decision is explained. Numerical constraints are suggested for the sizing / selection parameters of key equipment items. Moreover, the application conditions under which the system selection is appropriate are discussed. 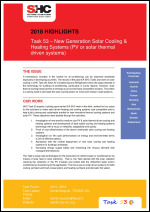 By following The Guide for any of the three specific solar cooling systems, the designer can expect to reliably achieve a robust, energy-saving solution. 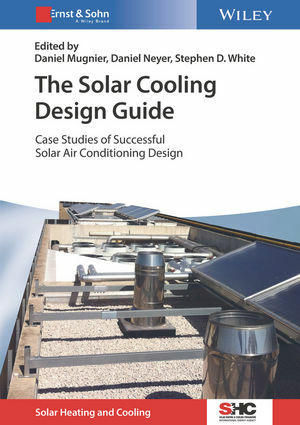 This book is intended as a companion to the IEA Solar Cooling Handbook which provides a general overview of the various technologies as well as comprehensive advice to enable engineers to design their own solar cooling system from first principles.